Valley Farm - Pineland Farms, Inc.
By selective matings on cow families proven to be consistent transmitters of desirable genetics we breed efficient, hardy, trouble-free cows with long, profitable, and productive lives. 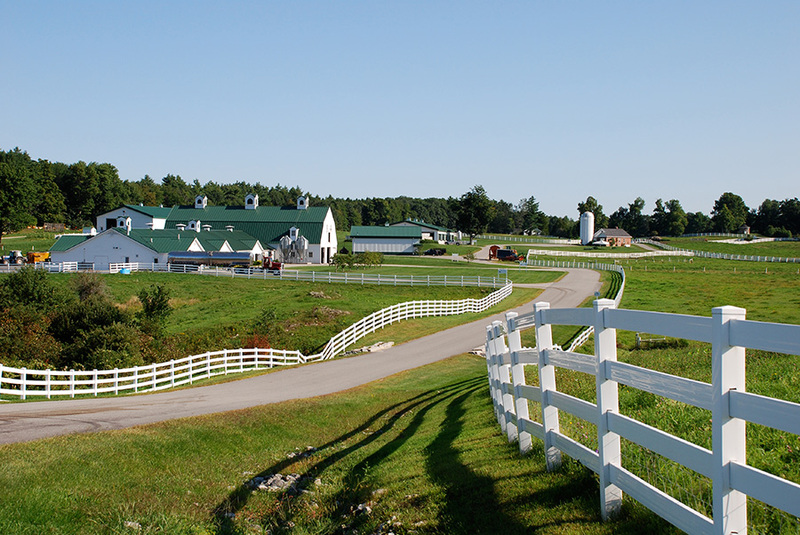 The herd was started by the well-known Merrill family at a neighboring farm in Gray, Maine in 1881. Three generations of Merrills developed the herd until both the farm and herd were purchased by Michael and Marilyn Wilson in 1961. Three generations of Wilsons developed the herd and were awarded the coveted “Master Breeder” designation in 1999. The “Wilsondale” prefix was used until 2001 when Pineland Farms purchased the herd and began marketing cattle under the “Wilson-dale” prefix and then the “Pineland” prefix. At the time of the Wilsons’ purchase, there was a yearling in the Merrill herd named Trina Redstone Marvel. That young cow’s lineage went back 16 generations in direct female line to one of the very first cows imported to the United States from Holland. “Old Trina”, as she came to be known, was not only an exceptional milk cow but she transmitted her traits to descendants with remarkable consistency. Transmitting ability, more than any other quality, is the key to any successful breeding cow. In the decades since 1961, hundreds of superior cows in the herd can be traced directly back to Old Trina; so much so, in fact, that her descendants have become known as a distinct cow family within the Holstein breed, the “Trinas”. Cows in today’s herd whose names begin with a “T” or an “R” are part of the Trina family. In addition to the Trinas, the herd includes outstanding individuals from several other nationally-known cow families. Hundreds of progeny from the herd have been exported over the years to European countries, Japan, and elsewhere. Pineland Farms continues to breed some of the very best milking cows, carrying on a tradition begun well over a century ago.